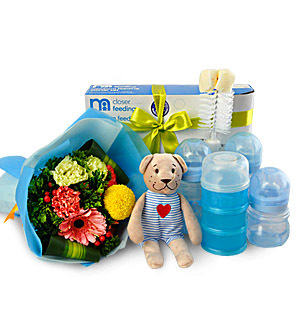 Be a star of any baby shower with this exclusive baby essential gift while introducing Mom with a great introductory kit with all the first essentials new mother needs for baby feeding and baby care. Includes Mothercare® Newborn Feeding Starter Set 7pcs which includes Feeding Technology bottle 240ml, feeding bottle 120ml, Silicone teats, Stackable milk powder dispenser, 2 in 1 revolutionary bottles and teat brush cleaner tongs for handling little one's feeding equipment easily and hygienically. all the first essentials new mother needs for baby feeding and baby care. This exclusive Mothercare® essential comes bundle with a Fabby soft heart plush Bear and cutesy posy of flowers. Same-day delivery applies for delivery within Klang Valley. For outstation deliveries, fresh flowers will be replaced by silk pomander flowers, toys or other baby items. At least 3 days notice is required for outstation deliveries. Call Giftlab at 03-78830233 / +6012-6915200 or email us at sales@gift-lab.com for assistance. Our Baby Shower Hamper Gift is ideal for New Mother and to welcome a Newborn Baby.